Applying for the communications 21 spring internship program was the smartest career move I have ever made—no offense to my previous summer-long stint at a falafel stand. At c21, everyone truly wants to help me succeed. They answer my questions, forgive my mistakes and include me. I’m learning basic office skills as well as complex tasks such as HTML coding, analytical reporting and content curation for social media platforms. If you are considering applying for this incredible internship, and you really should, read on to take a walk in my shoes. 8:30 a.m.: I grab the morning newspaper and walk into The Blue Horse business complex. I love the building—it used to be a note tablet binder factory. The trendy neighborhood of Inman Park is beautiful. Once inside the office, I lay out the Atlanta Journal Constitution and refill the printer paper. 8:40 a.m.: Time to work (notice that I didn’t have to grab anyone a latte?). I love the autonomy here. Nobody is hovering over me or telling me what assignment to do next. I start to draft Facebook and Twitter posts for a client. Finding content is a little tricky. I skim through multiple articles for one that corresponds with their brand and messaging. The phone rings occasionally and I transfer it to the appropriate person. 10:30 a.m.: I have a video editing training session with Jamie. Different people teach me depending on the topic, but they all make me laugh. In the video editing software, we manipulate a green screen to make a person look like they’re flying. 11:30 a.m.: I snag client media coverage for monthly reporting and search for circulation numbers. I get to hone my detective skills for this assignment. 12 p.m.: Everyone has an hour for lunch to use between noon and 2 p.m. There are many restaurants within walking distance. I prefer to bring my lunch and eat outside to enjoy the warm spring weather. 1 p.m.: I read over a client’s analytic dashboard report and analyze their social media activity. The report came back from review with multiple corrections. I remember being shocked when I first received a draft back covered in ink, but making mistakes is just part of the process. A thick skin and a good attitude goes a long way around here. 2:30 p.m.: Team meetings are held every Monday. We discuss schedules, social media content, clients and our weekend highlights. Sharon, our fearless leader and founder of c21, guides the meeting. It’s rare to find an internship program where the boss is actually around and available to talk. Sharon is very much present and open to my questions. 4 p.m.: I fetch the mail and then make calls to follow-up with a speaking opportunity for a client. 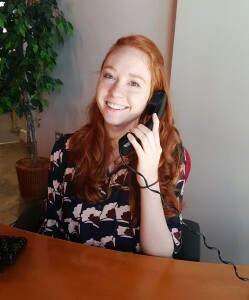 Starting out phone calls made me nervous, but this internship has pushed me out of my comfort zone. 5 p.m.: The office is winding down. I plug in my hours and check for missing information before writing a summary to the team of what I had accomplished for the day, and what’s on tomorrow’s to do list. 5:30 p.m.: Work-life balance is valued here. There is no expectation to work any later than 5:30 p.m. I do some last-minute organizing and leave to go home. It is satisfying going home after working all day on meaningful tasks. I feel prepared and optimistic when thinking about my next job. Now that you have taken a peek inside my day-to-day work life, what happens next? If you have strong writing chops and a desire to learn new skills, I highly recommend that you apply for the Summer 2016 internship program! After sending an email with your resume, cover letter and writing sample, the next steps include passing an interview and a writing test. Follow the link below for more information, and good luck!